We celebrated my daughter’s birthday on Saturday. It was held at the local gymnastic center, and she had a blast with all of her friends. It was great to see them all running and bouncing around. That evening Nick, Joe, Louis, Kevin, and I got together for some games. 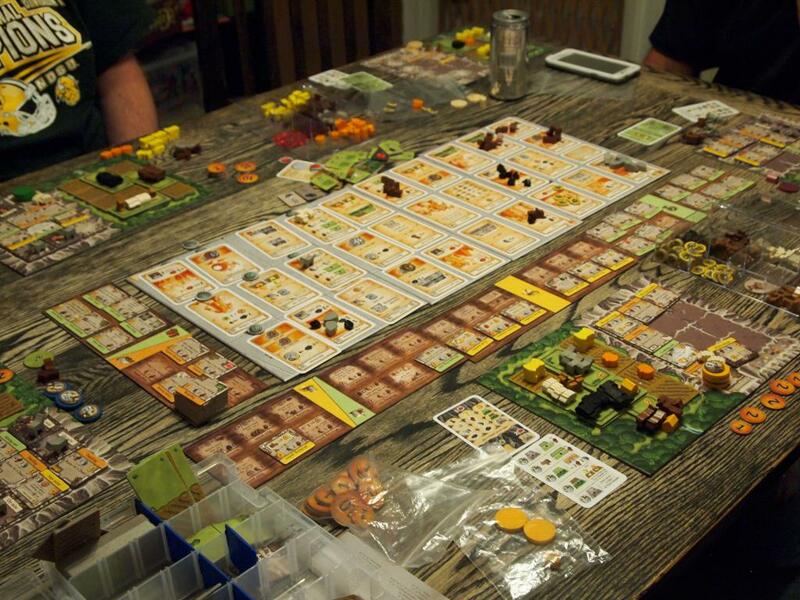 We started with Caverna. I was working towards a huge animal-centric game using wheat to feed my family, but my game was cut short. I had to bow out about two-thirds of the way through to help Gina when my daughter couldn’t go to bed because of an ear-ache. After getting her some medication and settled down I was able to see the end of the game. Joe and Nick had taken over the animal husbandry, while Louis had collected a ton of good and turned them into points. He ended up with 105 points and the victory. I needed to relax with a game after all the craziness, so – after Louis took off – Gina joined us for Glen More. 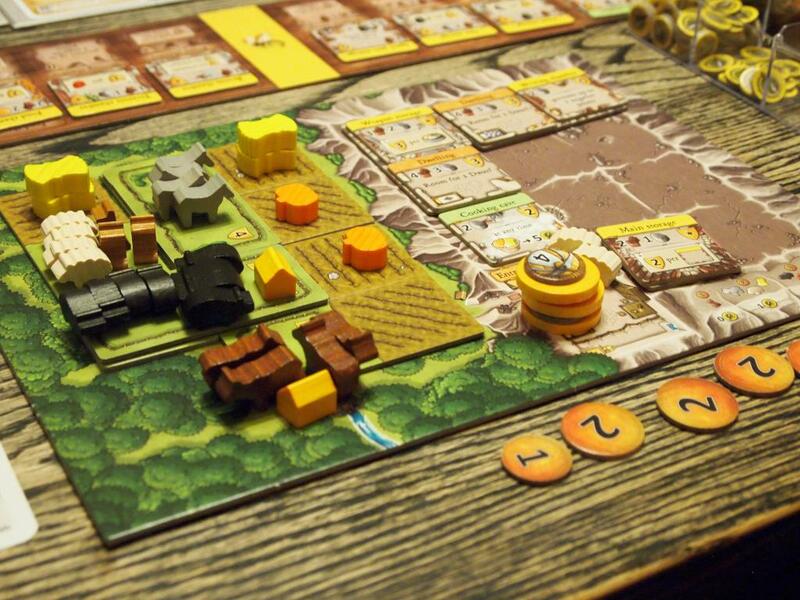 I was slowly making my way around the board, picking up villages and goods to sell at the annual fair. 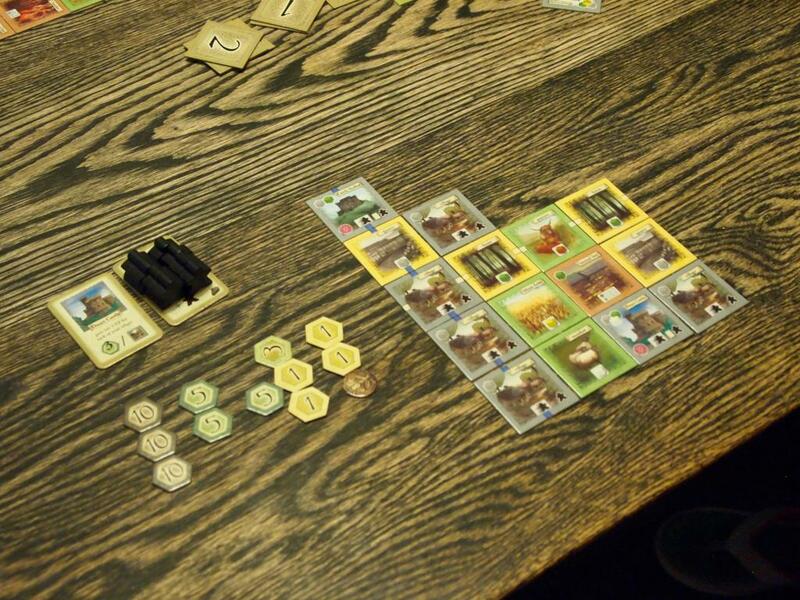 I was able to get the castle for bonus points with the villages, but I messed up my last round. Had I saved some goods instead of selling them, I would have had enough to buy Lock Oich and score more from my Fair. Instead I ended up three points of Joe. 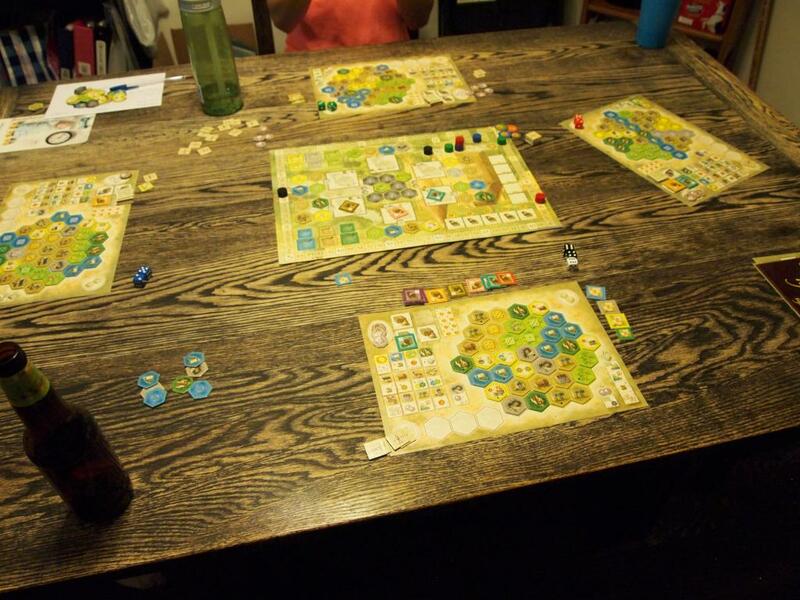 Sunday was spent unwinding, and I did get to play a quick game of Small world with my son. It took a little for him to get things figured out again, but we had a lot of fun before cutting it short to eat dinner. It’s been a busy week of gaming around here. 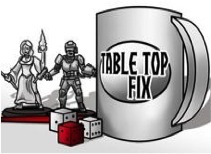 I played Tigris and Euphrates and Kingdom Builder with Joe, Louis, and Ben – a guy who found us via BoardGameGeek – on Wednesday. 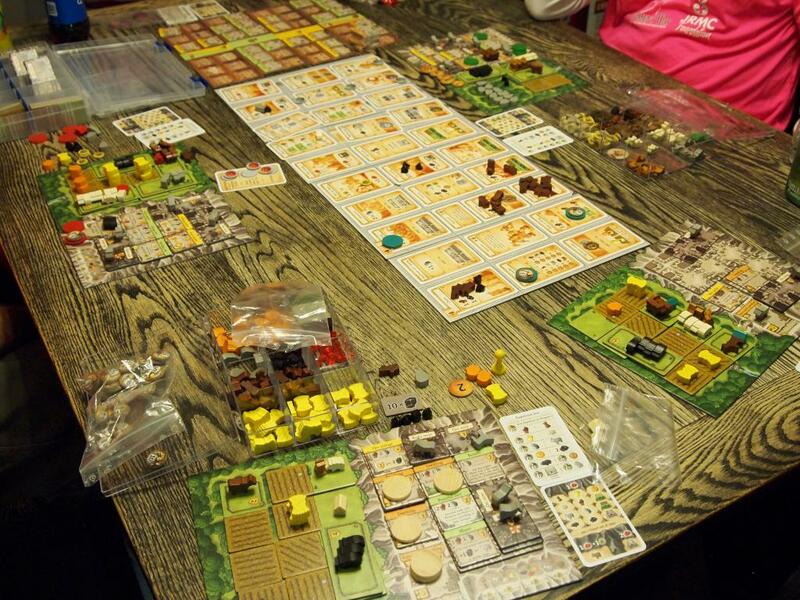 Then Thursday Joe, Gina, and I played Agricola. Ryan was going to join Joe, Gina, and I on Friday, but he was running a bit late, so we played Dominion while we waited. Joe got off to an early start with his Bishop, while Gina kept hitting us with Witches. I eventually got an engine running with Laboratories, but even though I bought a bunch of Provinces I was still a couple points short of Joe. 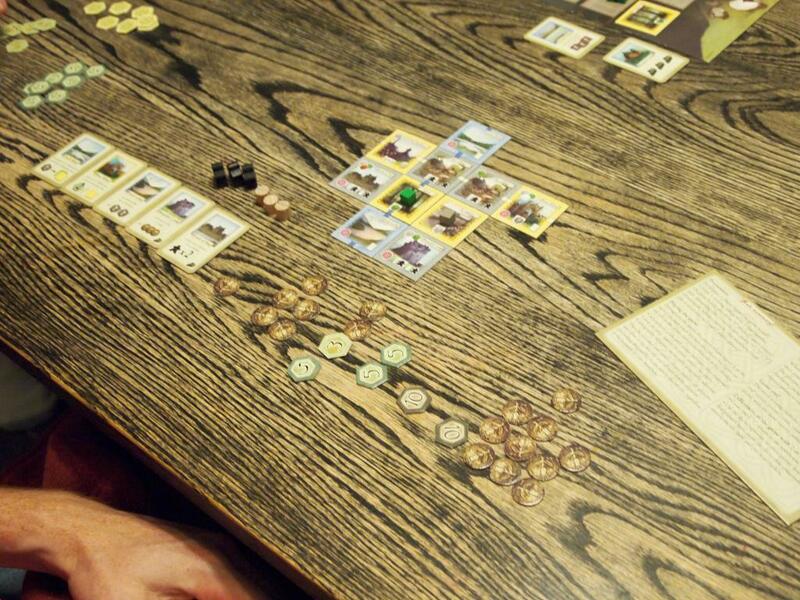 When Ryan arrived we played Castle of Burgundy. It was a pretty even game throughout. Ryan pulled ahead early with animals, but we all managed to catch up eventually. I picked up a couple of bonus point tiles and managed to get five of the estates for a big bonus. I also had a large shipment of the purple goods pushing me well into the lead. Gina was out of town Saturday, so it was just Louis, Joe, and I. 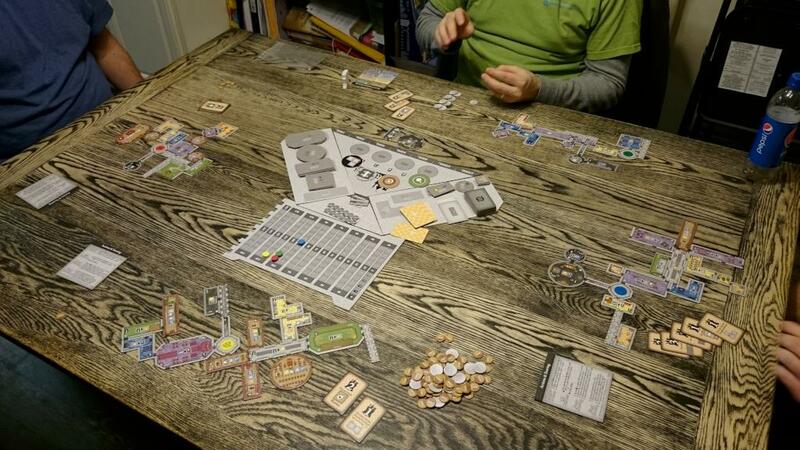 Again we kicked things off with Dominion, and I managed to win both games we played. The first was dominated by Louis’ Saboteur, but I was able to work around it using Goons to score points. I also had some Ventures that provided enough money to pick up a few Duchies. The second game got a bit ridiculous. 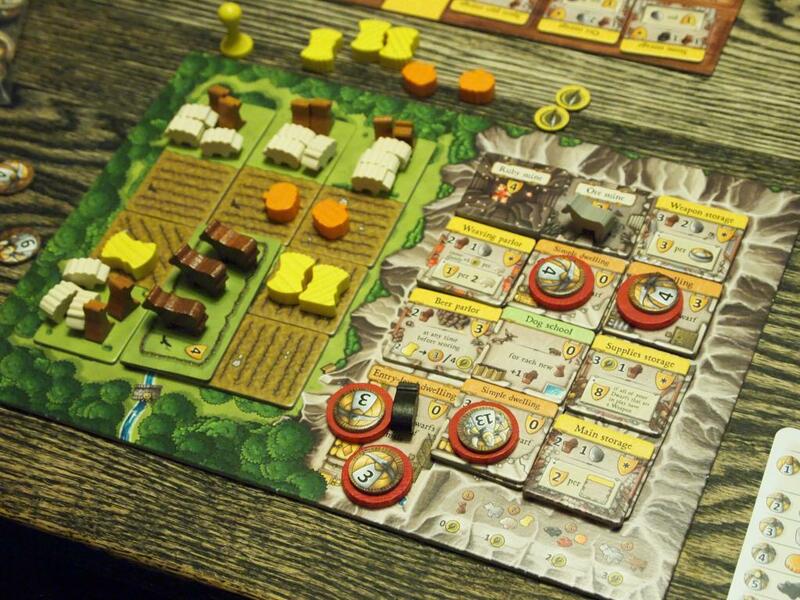 We had two different Villages and a bunch of plus-draw and buy cards. At one point I had so many buys that I was able to buy a Province and six free Peddlers on the same turn. A few turns later I bought the remaining four Peddlers. At that point I was able to consistently buy two Provinces at a time, and the game quickly ended. 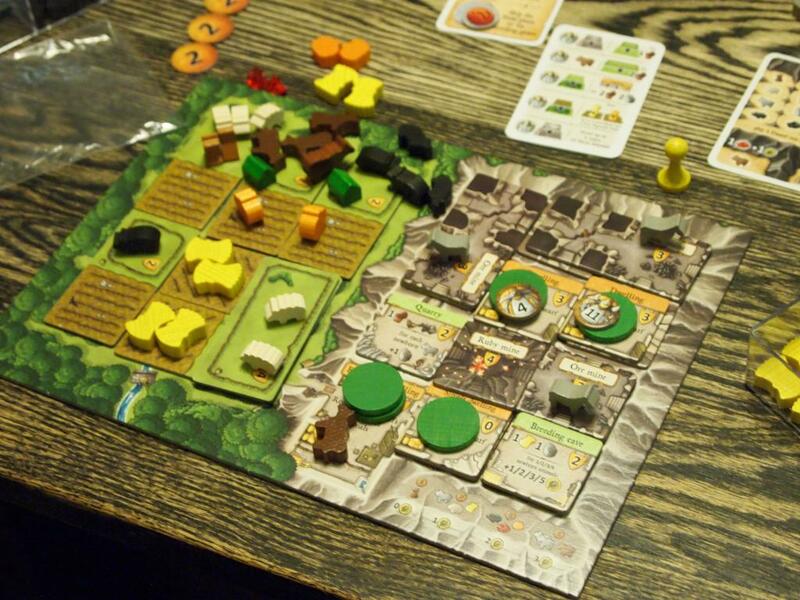 Kevin showed up at this point and we played Caverna. I grabbed the Office early and was using it to get as many tiles as I could. It was taking quite a bit of work, so I was glad that I was able to get a dwelling and then the Couple’s Dwelling fairly early, and by the end of the sixth round I had a full family. Feeding them was a bit of a challenge, but eventually I managed to get some vegetable farming going and shortly thereafter a herd of boars. Kevin was also following the full family path, concentrating on his farm and maximizing a single dwarf in the questing. Both Louis and Joe only had two dwarves throughout the game. They were both using the questing spots for strong gains. 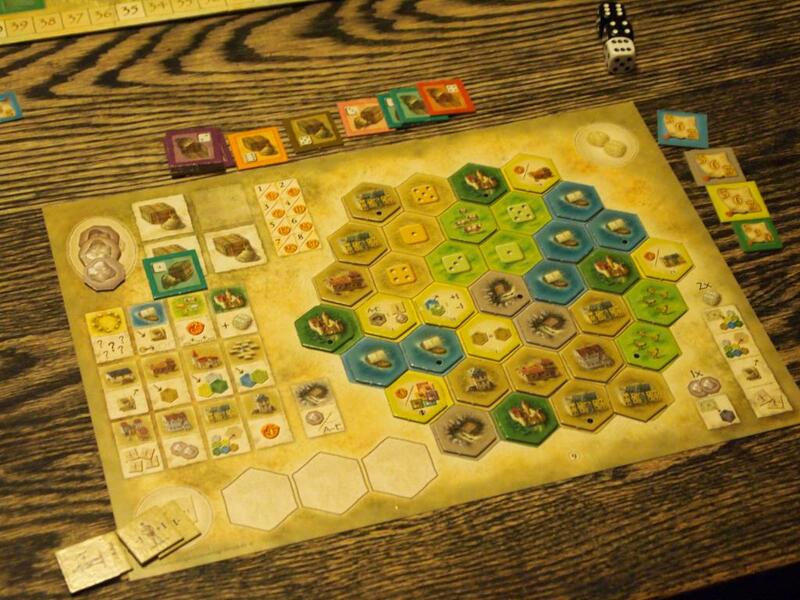 Joe had monopolized the sheep, ending the game with twenty of them, while Louis was gathering rubies and ore for bonus points. 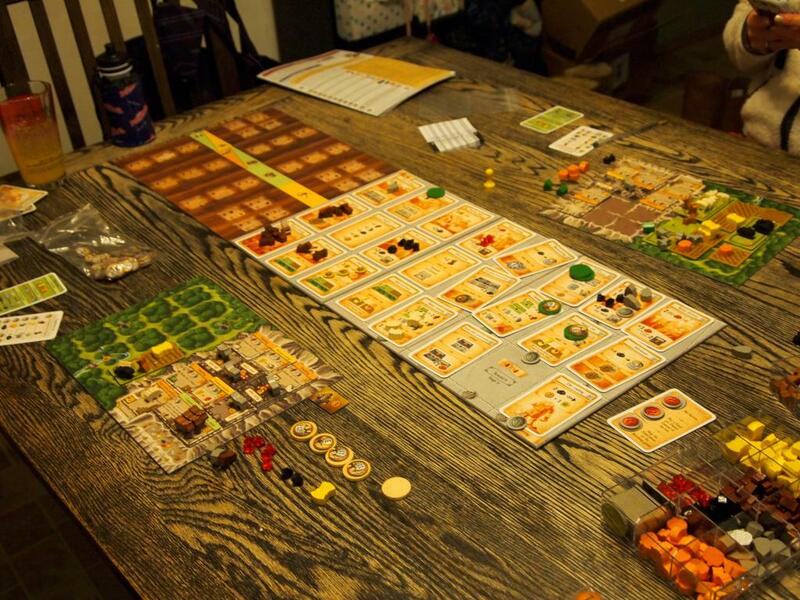 The difference in the game ended up being the tile that provided me with bonus points for veggies and wheat that I picked up in the last round. I received twelve points from that and ended up beating Louis by eight. The differences in scores was interesting, as Kevin came in last with his full family, with Louis and Joe – with only two dwarves each – came in second and third. 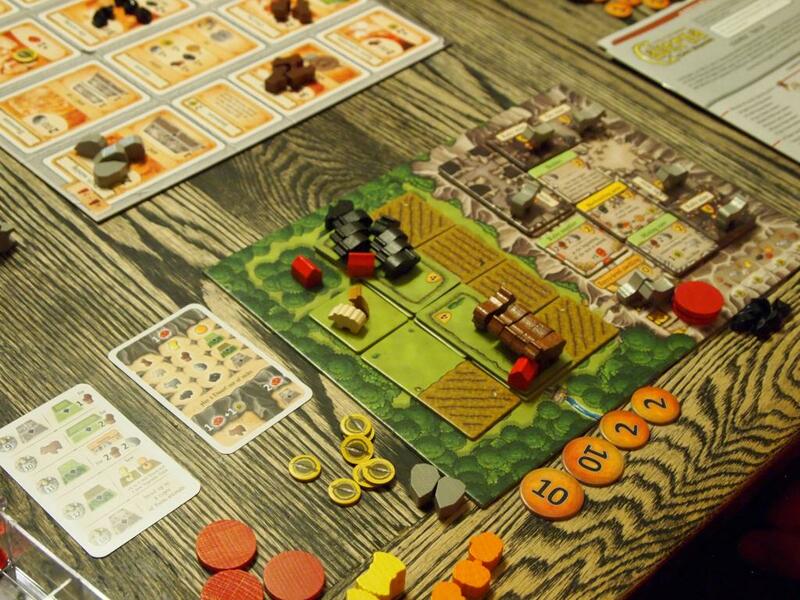 Caverna was the choice again Saturday. We had five this time, with Joe, Kevin, Louis, Gina, and I all playing. 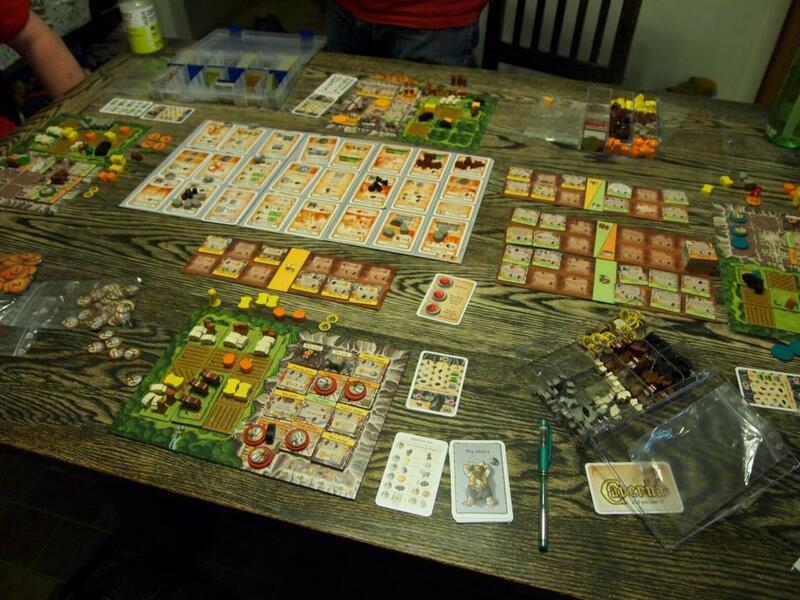 I had intended to focus mines and donkeys to produce food and goods, but I never quite got there. I was too slow to get a couple of the furnishings I wanted and just wasn’t moving as smoothly as I’d like. Louis had a really nice farm going with only two dwarves. Joe had four of his dwarves, while Kevin and Gina each had three. I had a full five by the end of the game, but it wasn’t until I bought the furnishing that allowed me to feed my family with my weapons. 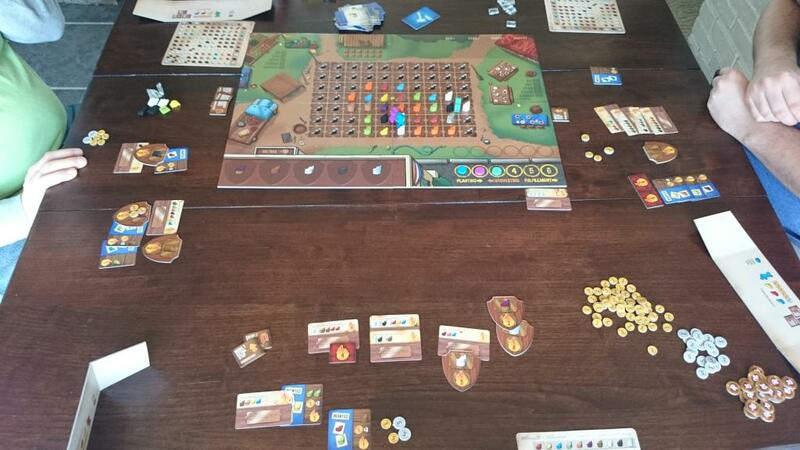 I was then able to spend my fortune of ore on feeding my family, but it wasn’t terribly inefficient. 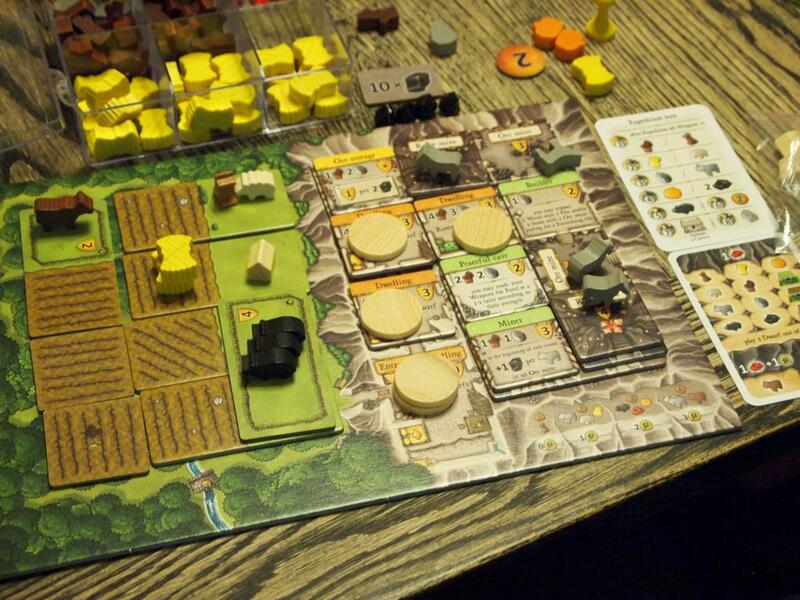 Joe had the most efficient and powerful farm, gathering stone and using it for points, along with plenty of gold at the end. Gina called it a night, so the rest of us stayed up for Trajan. I am apparently terrible at the game, but it was still fun. I wanted to work the senate and the military for points, but really didn’t progress either very well. Kevin had managed to get two sets of four from the workers using a couple of wildcards, and that 40 points set him well in the lead. Another busy weekend for me, with Gina away for a half-marathon. 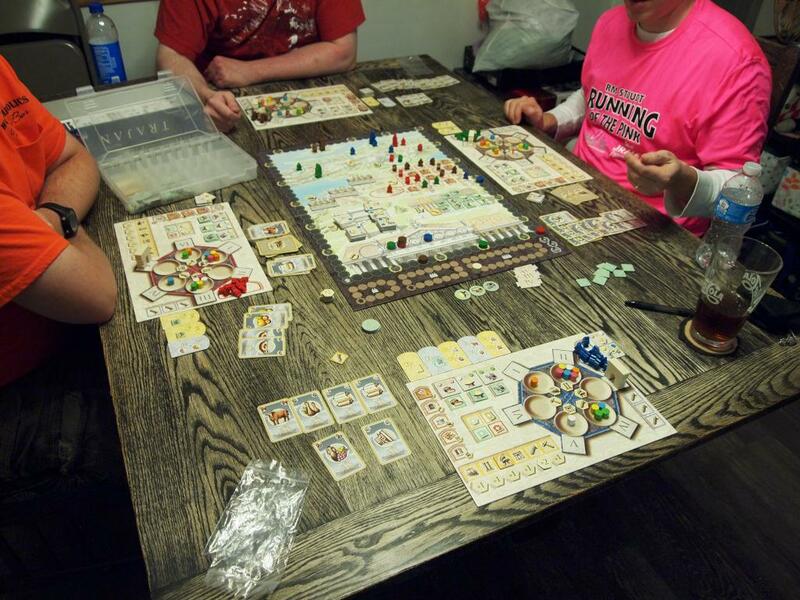 Louis, Kevin, and Joe were able to come over for a game Saturday though, and Joe wanted another round at Caverna. This time, I wanted to go for a more mining-centric approach, but started off a bit slowly when Louis and Joe nabbed the early caverns and tunnels. I didn’t really have a strong plan to feed my family, so I was struggling with that early as well. I did end up being the first to expand my family, and managed to gather some vegetables and animals to lower my feeding concerns. 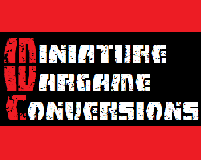 Joe snatched up a couple of the furnishings that I had wanted, so I ended up just focusing on mines and animals. 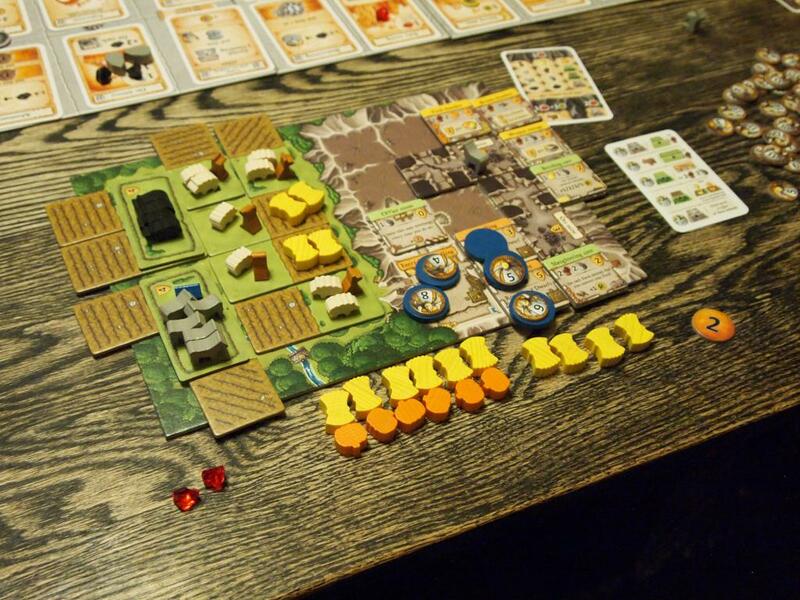 I had filled nearly my entire cave with mines and dwellings by the end, and my farm was filled with pastures and fields. I had quite a few animals, but limited bonus points. Kevin also had a decent supply of animals and some bonuses. Louis had a nice farm going, while Joe had the best warriors. In the end, though, I had just enough to tie with Kevin for first with 76 points. Joe and Louis were only a few points behind, for a nice close game. I hope everyone had a wonderful holiday weekend. Gina and I spent most of the weekend working on our kitchen remodeling project. 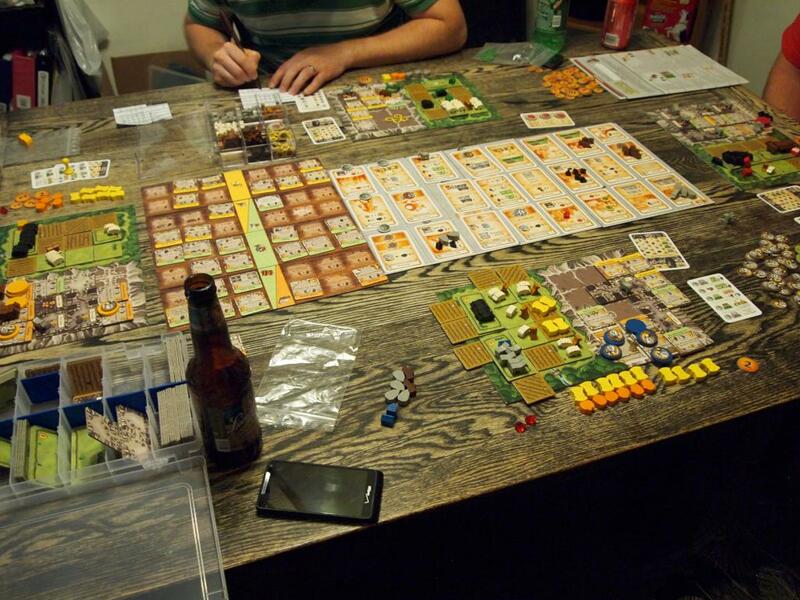 We did manage to make time for a game of Caverna Saturday night with Joe and Kevin. It was Joe and Kevin’s first time playing, so there was some learning curve involved. 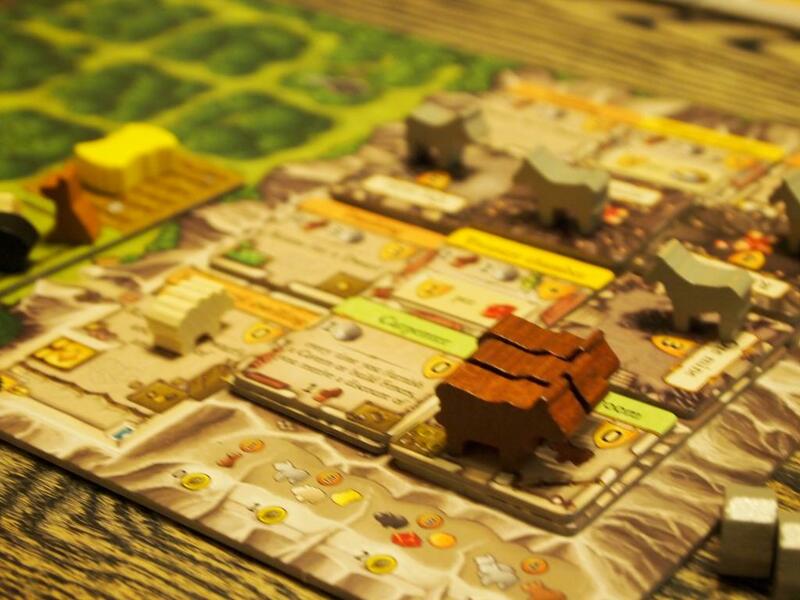 Joe was heavily focused on expanding his cave with mines, while Kevin was creating pastures for sheep. Gina had a huge vegetable farm going. I was the only one not dabbling in the expeditions. I was working with grain to power my brewery feeding engine and then I started expanding my cave and family. I decided about halfway through that no one was really pushing the questing aspect, so I bought the furnishings that provided bonuses for having armed dwarves and started questing. I managed to get all of my dwarves armed and one to level 14. I picked up a ton of sheep and dogs along the way. I finished the game in first with 93, followed by Joe, Kevin and Gina. 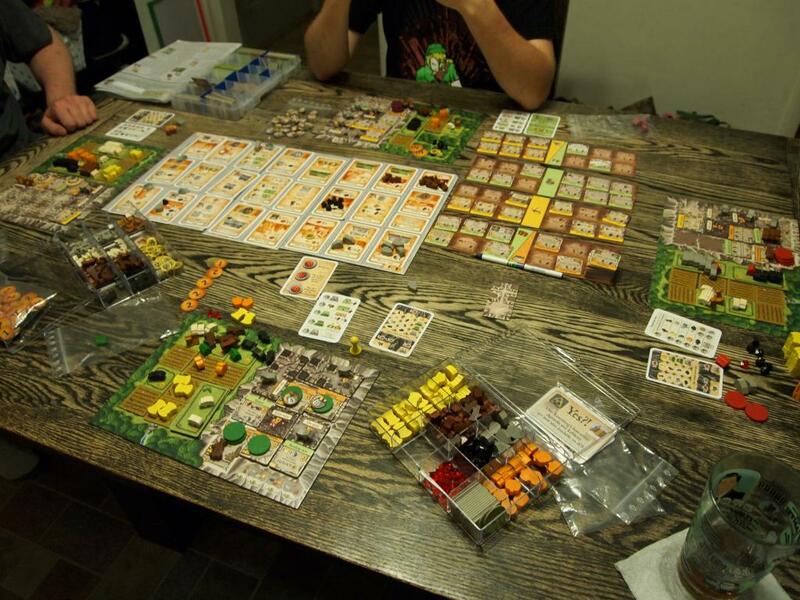 Following my company party where I won a travel case of Chess, Checkers, and Backgammon, Gina and I sat down to learn Caverna. It was pretty straight forward and we picked it up quickly. We just played the introductory game to keep the number of options down. Gina went straight for the farming, with grain, vegetables, and sheep. I was more focused on my cave, decking it out in mines, and useful furnishing. My fields were almost completely neglected. Thanks to my adventurous dwarves, though, I was able to score a bunch from rubies and bonuses and win overall, with Gina only about 10 points behind me. Saturday night, Gina was out at a party, but Louis and Kevin were available. We learned Snowdonia, but I forgot to get pictures. Louis was pushing his surveyor forward often, while I was the only one who had a train. Otherwise we all did a bit of everything. I had picked up five contracts, which ended up being the difference. I completed them all, and won the game with an even 100 points. Kevin was next with 86 and Louis had 73. Kevin and I finished the night with a quick game of Glen More. He was working the distilleries and managed to grab all three taverns. He also had a bunch of villages and the bonus castle for them. I had Iona Abbey, which provided a bonus for yellow tiles. I had plenty of those, and was working an Annual fair for all it was worth, but I still ended up three points short at the end of the game.